Need a last minute Halloween costume? For women, you can’t go wrong with a classic witch costume – a basic witch Halloween costume is easy to put together from items in your wardrobe, plus black is always stylish! You can make your witch costume as simple or eye-catching as you like, depending on what you have to hand. For an easy witch Halloween costume all you will need is a black dress and a witches’ hat, plus any accessories you can rustle up at the last minute. Stripy tights, spider earrings or a wild grey wig are all great ways to add flair, or you can get creative with make up. Full green make up can be tricky, but you can make a real statement with just pale foundation and eyeshadow. You could create a gaunt look with hollow cheeks, or go as a glamorous witch with shimmery eyeshadow, dramatic winged eyeliner and purple lipstick. 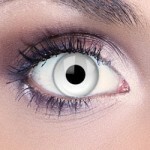 If you have time, Halloween contact lenses are a great way to make a simple costume more effective. 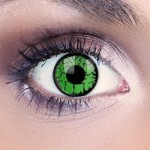 You can find a great choice of witch contact lenses online, including the selection below. 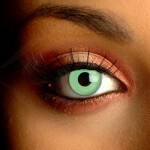 Go for classic witchy green eyes, dramatic blackout contact lenses or even spooky all-white contact lenses. Coloured contact lenses will make your witch costume stand out and can be worn again with another Halloween costume or to another party.